Middle aged and self-loathing, Adam Camp is on the edge of despair as his wife threatens to leave and his son is gripped by drug addiction. But a chance meeting with a mysterious old painter in a city park sets Adam on a journey that will dramatically reshape his world. "Dr. Clinton's novella will encourage, inspire and challenge you to greatness." "This book is so compelling that I skipped an NFL playoff game because I could not stop reading. This story will instruct and inspire." 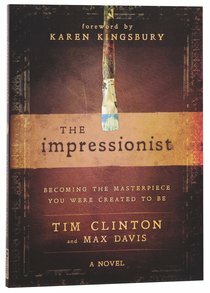 "The Impressionist causes us to face the truth about ourselves and our desperate need for a Savior." Middle aged, disappointed and self-loathing, Adam Camp is anything but the picture of a successful man. With his wife threatening to leave him and their son addicted to drugs, Adam teeters on the verge of absolute despair - questioning his own existence and purpose for living. After an explosive argument with his wife, Adam searches for an escape as he sets out on a journey that will dramatically recolor his world. While walking through the city park, Adam is approached by an old painter. The mysterious artist convinces Adam to let him paint his portrait and what happens next is nothing short of a masterpiece. "Combine the insights of Tim Clinton and the storytelling of Max Davis, and what you get is a wonderfully entertaining glimpse into the very soul of human existence." "The Impressionist is one of those rare books that tugs on your heartstrings, unveiling things deep within your soul, things you didn't even know were there. Anticipate it and savor it!" "Transformation is waiting to be unlocked in these pages!" Dr Clinton is the Executive Editor and co-author of Caring for People God's Way: A New Guide to Christian Counseling and Competent Christian Counseling: Foundations and Practice of Compassionate Soul Care. He was Executive Editor and a primary writer for The Soul Care Bible and the author of Attachments: Unlock the Secret to Loving and Being Loved; Why You Do the Things You Do: The Secret to Healthy Relationships, Loving Your Child Too Much: Staying Close to your Kids without Overprotecting, Overindulging, or Overcontrolling and Turn Your Life Around: Breaking Free from Your Past and Discovering God's Dream for You.